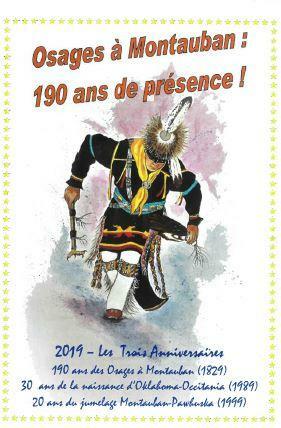 "Osages in Montauban: 190 years of presence!" ... Announcement of the OK-OC (Oklahoma-Occitania) association poster ... of course it is not a continuous presence but a "dormant presence" punctuated by regular meetings in the ground Montalban or Indian. 2019 will mark three anniversaries: the 190th anniversary of the arrival in Montauban of the three lost wizards (Petit Chef, Grand Soldat and Femme Faucon) in November 1829 and the 20 years of the twinning Montauban - Pawhuska initiated in September 1999. "We are counting on the presence of Osages, including some official representatives of the tribe "ensures Jean-Claude Drouilhet founder of the association OK-OC. In the meantime, here is what the program of these festivities could give: - Wednesday, April 17 at the cinema La Muse, Film "OK-OC and the Osages" - debate with Claude Sicre and OK-OC - From May 3 to May 16 at the 'Former College exhibition "Osages in Montauban: 190 years of presence!" 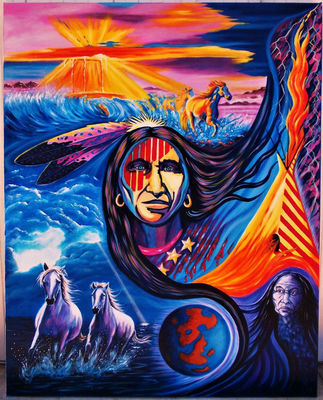 - Friday, May 10 Plant Garden (Indian Land) Ceremony dedicated to the abolition of slavery and the deportation of American Indians with the participation of Osages. - Friday May 10th and Saturday May 11th at Eurythmie show "On the Road Again"; between heaven and earth "Compagnie de l'Hatchet - Tuesday, May 21 at the Old College conference" the art of Osages "Marie-Claude Strigler (Paris III University) - Wednesday, May 22 at La Femme Renard. authors of "Wazhazhe" Benoît Séverac & Hervé Jubert - Wednesday, October 9th at La Muse cinema, "September in Oklahoma" film with Francis Fourcou and OK-OC - Friday, October 11th at Les Augustins theater, "Hommes Rouges, son de" Earth "Company of the Baladins of Icaria.